In The Cambridge Companion to Keats, leading scholars discuss Keats's work in several fascinating contexts: literary history and key predecessors; Keats's life in London's intellectual, aesthetic and literary culture; the relation of his poetry to the visual arts; the critical traditions and theoretical contexts within which Keats's life and achievements have been assessed. 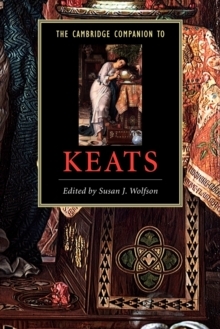 These specially commissioned essays examine Keats's specific poetic endeavours, his striking way with language, and his lively letters as well as his engagement with contemporary cultures and literary traditions, his place in criticism, from his day to ours, including the challenge he poses to gender criticism. The contributions are sophisticated but accessible, challenging but lucid, and are complemented by an introduction to Keats's life, a chronology, a descriptive list of contemporary people and periodicals, a source-reference for famous phrases and ideas articulated in Keats's letters, a glossary of literary terms and a guide to further reading.